Basic Hat Pattern: Basic Hat Pattern "Diamonds of Praise"© Version 90-C "Quickie Newborn"
Basic Hat Pattern "Diamonds of Praise"© Version 90-C "Quickie Newborn"
"Diamonds of Praise"© Charity Hat Pattern "Quickie Newborn"
The baby doll I'm using her head is too small. Her head is 9" but the hat fits a 10" to 11" newborn head. Notes: A quick and super easy pattern when you want to create hats for charity. I used Red Heart Super Saver Baby Pink. Gauge: Measuring across rounds 1-4 it should equal 3”. Hat Size: The hat has a lot of stretch to it and will fit a 10" to 11" newborn. Rounds 7-9. Repeat Round 6. 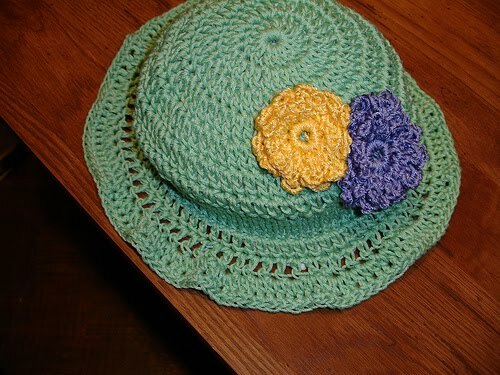 Basic Hat Pattern, Version 33, "Fruitful"